Venus is a fascinating planet that in some ways is very similar to Earth but also has many differences. 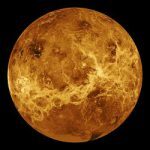 Here are some cool and interesting fun facts about Venus for kids and adults alike. Probably the most amazing fact about Venus is that one day on Venus is longer than one year! That doesn’t sound possible, so how could it be? Well, a day is defined as the time taken for a planet to rotate on it’s axis. Venus takes 243 Earth days to do this. A year, on the other hand, is defined as the time taken for a planet to orbit the sun which in Venus’ case takes 225 Earth days, i.e. less time than one Venus day. Venus is the second planet from the sun, after Mercury. It takes nearly 6 minutes for light from the Sun to reach Venus. Venus’ rotation period of 243 Earth days is the longest of all the planets in our Solar System. Venus is also the hottest planet in the Solar System. The mean surface temperature on Venus is 462 degrees Celcius. That’s hot enough to melt lead! After the moon, Venus is the second brightest object in the night sky. You can even see it in daytime on clear days. If you lived on Venus the sun would rise in the west and set in the east because Venus rotates in the opposite direction to Earth. Venus is often called Earth’s “sister planet” because they are so close in size and mass. The diameter of Venus is 7,521 miles, which is only 397 miles less than that of Earth. Venus’ mass is 82% of that of Earth. Venus was the first planet to be visited by a human spacecraft. The Mariner 2 space probe visited Venus in 1962, passing within 22,000 miles of the planet. In 1966, Venera 3, a Soviet space probe, became the first to land on Venus. Venus was named by the Romans and is named after their goddess of love and beauty. It is the only planet in the Solar System that is named after a female figure. There are no seasons on Venus because it doesn’t tilt on it’s axis like Earth does. Well, that’s not quite true; it does tilt ever so slightly – approximately 3 degrees, which isn’t enough to cause seasons. Venus has no moons or rings. It does, however, have more volcanoes than any other planet in the Solar System. The atmospheric pressure on Venus is 90 times greater than that on Earth’s surface. The pressure on the surface of Venus is similar to that at a depth of 1 kilometre in Earth’s oceans. It used to be thought that Venus was two different planetary bodies because as it orbits the sun, it overtakes Earth every 584 days. It then becomes visible before sunrise (when it’s known as the Morning Star) rather than after sunset (when it’s known as the Evening Star). Venus is what is known as a “terrestrial planet”, which means it’s made of rocks and metals and hence has a solid surface. It is one of four terrestrial planets in our Solar System, the others being Mercury, Earth and Mars. Venus is the most perfectly round of all the planets. It is almost perfectly spherical, making it’s polar and equatorial diameters more or less the same. Venus can be seen in the painting The Starry Night by Vincent Van Gogh. It also appears in many poems, including ones by William Blake and William Wordsworth.